SAN DIEGO – Feb. 28, 2018 – Daybreak Games® today announced the official launch of H1Z1®, the original standalone battle royale game that sparked a worldwide phenomenon. H1Z1 is now available on Steam for Windows PC with a brand-new game mode, Auto Royale™, injecting high-octane vehicular mayhem into the genre. 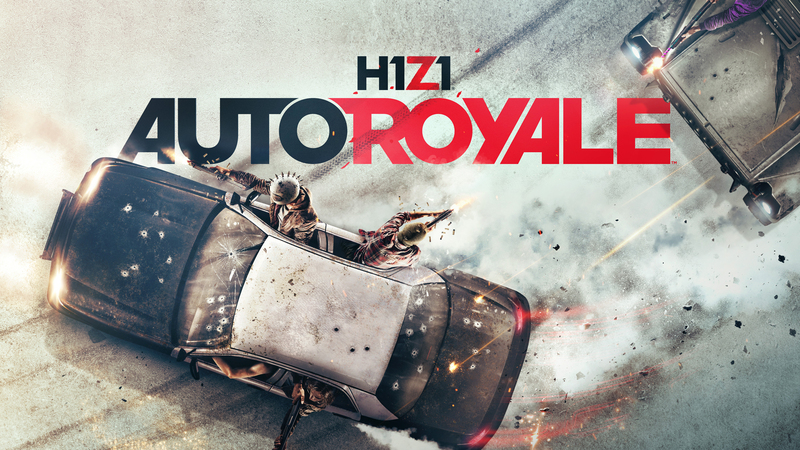 Inspired by H1Z1’s fast-paced vehicle play, the new game mode – Auto Royale – features up to 30 teams of four in a battle to be the last vehicle standing. Teams speed around the massive map looking for power-ups, weapons, ammo, fuel, and health as they try to out-shoot, out-drive, and out-last the competition. The mode introduces two new vehicles to H1Z1, a sedan and an armored recon vehicle (ARV), and a variety of features to cause vehicular havoc, including ramps, land mines, oil slicks, turbo boosts, vehicle jumps, corrosive smoke, and much more. Two New Vehicles: Players can choose from two vehicles in Auto Royale – Sedan or ARV – both new to the game and only available in Auto Royale. Sedan: Nimble car with faster acceleration and higher jump clearance, allowing skilled drivers to quickly evade enemies. Armored Recon Vehicle (ARV): Offers more stability, making it easier to drive for new players, but has less turbo fuel efficiency. New Weapons: The Light Machine Gun (LMG), available only in Auto Royale, deals the most sustained damage of any gun in the game. New Power Ups: Players pick up evasive, defensive and combat drops to throw opponents off their trail, heal themselves, or deal damage to enemy vehicles. Defensive drops include vehicle repair kits, environmental buffs, fire extinguishers, and vehicle armor. Evasive power ups include smoke screens, high-octane fuel, turbo boosts, and oil slicks. Combative pick-ups include land mines and corrosive smoke. Auto Royale is currently in Beta and will continue to develop with feedback from the community. Along with the new vehicular battle royale game mode, H1Z1 launches with a plethora of new features designed to enhance the game’s competitive nature and fast-paced combat. Tactical Deployment: Players can choose which area to parachute into at the start of a match using a heat map that shows locations of where other players spawn. Airdrop Revamp: The airdrop system has been refined to add more points of contention, increasing the drop frequency and item value. Season 1: The official first in-game Season for H1Z1 starts with an all-new scoring algorithm designed to reward consistency and aggression, not just a player’s 10 best placements. Mini Map: Players now have the option to turn on a mini map to help the navigate the world. Founder’s Item: All players who bought H1Z1 during Early Access will receive a special in-game shirt. H1Z1 evolved tremendously during Early Access thanks to continued feedback from the community, leading to overhauls to the combat and vehicle systems, the addition of skirmishes and airdrops, changes to the toxicity system and more. The game will continue to escalate its solo and team-based last-person-standing thrills with new updates after release, including Z1 Remastered, a revamped version of the fan-favorite map from H1Z1’s early days. Daybreak is committed to further growing H1Z1’s competitive scene with support for structured organized play, tournaments and the H1Z1 Pro League. H1Z1 is now available for $19.99 through Steam for Windows PC. For more information, visit www.h1z1.com, as well as Facebook, Twitter, YouTube and Twitch. H1Z1 is a fast-paced, highly competitive, battle royale shooter. Parachute in and search for weapons, ammo, vehicles and supplies to stay alive. As a toxic gas cloud compresses the map, develop your strategy and prepare for the spectacle of mayhem. Go solo or group with a team of two or five to be the last ones standing. ESRB Rating: Rated T for Teen for Violence and Blood. Daybreak Games is a worldwide leader in massively multiplayer online games and emergent gameplay best known for its blockbuster hits and franchises, such as H1Z1®, EverQuest®, EverQuest®II, PlanetSide®2 and DC Universe™ Online. Daybreak creates, develops and provides compelling online entertainment for a variety of platforms. To learn more, visit www.DaybreakGames.com.